To Be Gluten Free is a featured vendor at various events across Long Island and bakes for fundraisers as well. To inquire about To Be Gluten Free selling goodies at a local event or donating baked goods for a fundraiser, email zoe.tobeglutenfree@gmail.com. Gemelli Gourmet Market North is a small market that sells fresh, pre-made food amongst other items. In its cafe section, Gemelli's sold a variety of To Be Gluten Free goodies in 2017. To Be Gluten Free was a vendor throughout the summer of 2017 and 2018 at the Sea Cliff Farmer's Market. Items sold included classics like Nutella Muffins and summer specials such as mini coffee cake loaves. 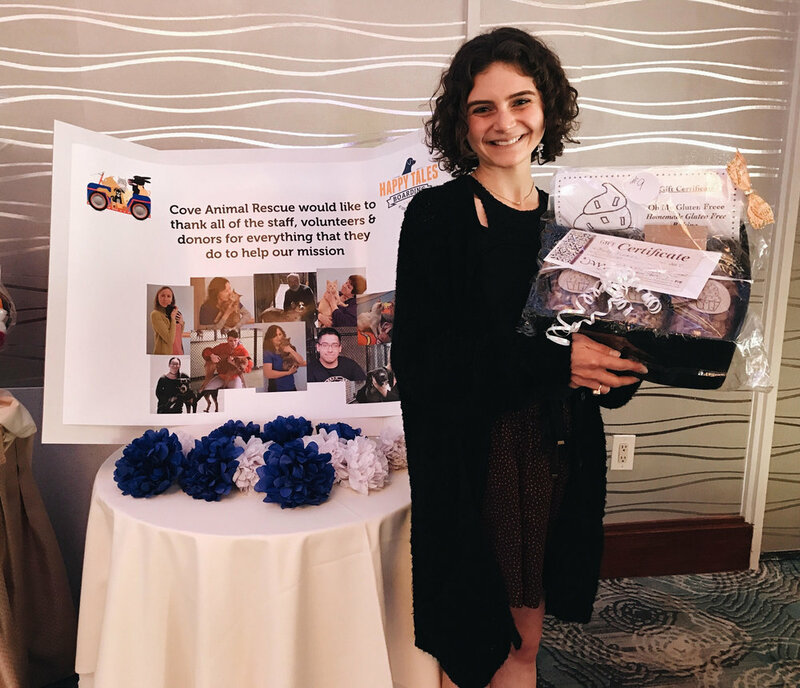 Peanut butter dog treats were also sold through To Be Gluten Free's "Give a Bone, Get a Bone" program in which all money made from dog bone sales was donated to Cove Animal Rescue. For each dog bone sold, one was baked for a dog at the rescue as well. On the first Sunday of October, Kiwanis International sponsors the Village of Sea Cliff's annual Mini Mart. Vendors line the main street in Sea Cliff and local artisans from across Long Island show off their goods. To Be Gluten Free (formally known as Oh My Gluten Freee) is proud to have been a vendor at Mini Mart in 2016 and 2017. To Be Gluten Free's Mini Mart offerings. To Be Gluten Free's stand at Mini Mart 2017. The Malin Family at Mini Mart 2017. Zoe and her partner in crime, her mom! I volunteer at Cove Animal Rescue, an incredible animal shelter in Glen Cove, Long Island. Each year they host a gala to raise money and thank their supporters. An auction is apart of the gala, and To Be Gluten Free puts together a raffle basket each year! 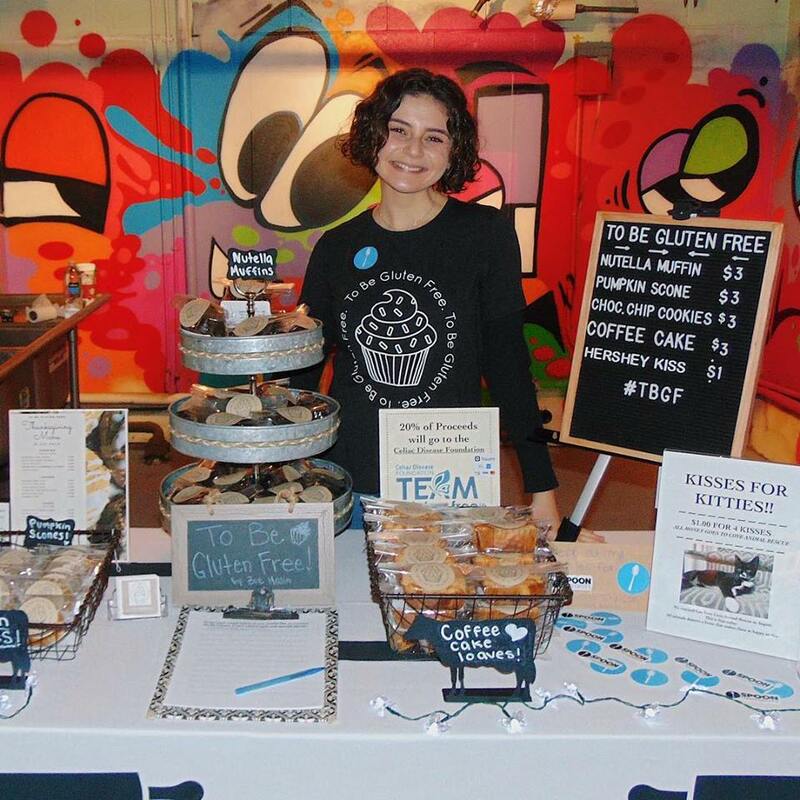 To Be Gluten Free was a featured vendor at Art in Motion in April 2017 and the First City Market in November 2017 at Glen Cove’s First City Project. To Be Gluten Free loved being apart of this fantastic fall pop-up art gallery and vendor market. Special thanks to Wildflower Long Island for inviting To Be Gluten Free to be apart of this incredible day. Zoe at To Be Gluten Free's table! To Be Gluten Free sold Nutella Muffins, Coffee Cake Loaves, and more. Promotional poster created by Zoe Malin. To Be Gluten Free's offerings. Zoe showing off the To Be Gluten Free shirts she designed. Mini Coffee Cake Loaves packaged and ready to go. Chocolate Chip Cookies are a fan-favorite. Helping customers choose which delicious treat to eat! For Northwestern University Dance Marathon’s BUILD party in December 2018, I baked 60 sugar cookies for Communities In Schools of Chicago students from three elementary schools to decorate. Communities in Schools of Chicago was the NUDM benefactor during the 2018-2019 school year, and Northwestern University students raised money for this incredible organization all year long. Catnip is an organization under Northwestern University’s News Network. The group specializes in unscripted, variety and entertainment content. I had the pleasure of working with the Catnip team for their video, “Catnip in the Kitchen.” Check it out… click HERE. 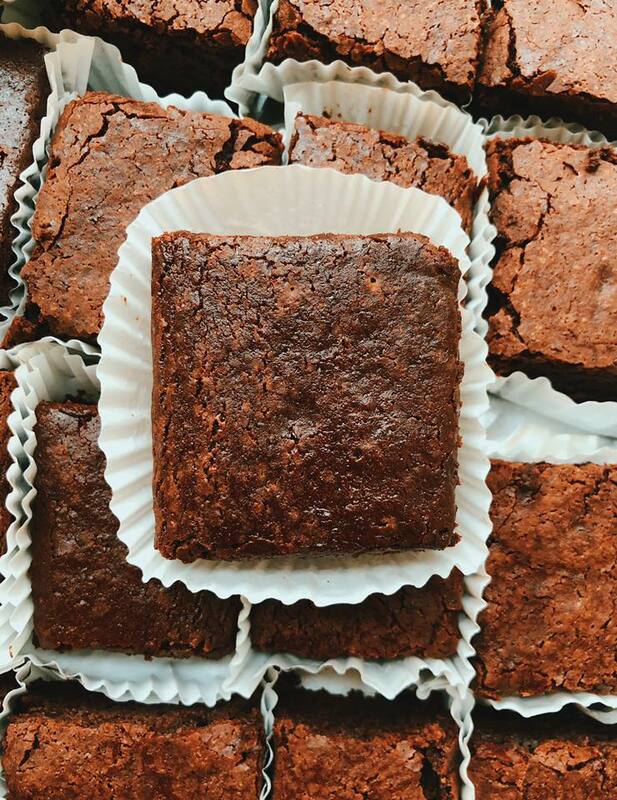 In March 2019, I baked 200 vegan & gluten free brownies for Northwestern University's Dance Marathon. A thirty hour long event, NUDM is one of the largest independent student-run philanthropies in the nation. Participants raise money for a specific benefactor, this years’ being Communities in Schools of Chicago. Thirty hours of dancing makes for some hungry people, so throughout NUDM, dancers chow down on goodies donated by local vendors. To Be Gluten Free made sure dancers with food allergies got their fair share of sweet treats, too. Huge thank you to Tynan Friend and Nicole Bankoski for asking me to be a part of NUDM in the sweetest way possible!